With four airlines offering business class service between Brisbane and Auckland – Qantas, Virgin Australia, China Airlines and Air New Zealand – there's fierce competition on this trans-Tasman trek, both in fare prices and in the experience offered to business class passengers. Air New Zealand puts its best foot forward by running true international-grade Boeing 777s on selected flights across the ditch – the same as you'd expect to find on longer routes to the USA, for example – offering fully-flat beds, direct aisle access and three-course, tray-free meals in its Business Premier cabin. Australian Business Traveller took to the skies to brings you this review. Frequent flyer program: Air New Zealand Airpoints, Star Alliance. Virgin Australia Velocity points can no longer be earned on AirNZ flights, but you do have other options like Singapore Airlines KrisFlyer or United MileagePlus, too. Carry-on baggage allowance: Two bags at up to 14kg combined total weight with a maximum of 10kg in a single piece, plus one small personal item. Checked baggage allowance: 3x23kg bags for all passengers, regardless of frequent flyer status. Airport services: Priority check-in, Express Path security and immigration in Australia, priority boarding and priority baggage delivery. However, in Brisbane, there was only one staffed priority check-in counter in use and the queue to obtain a simple boarding pass took around 20 minutes, when kiosks weren't available. Under Star Alliance rules, AirNZ Business Premier passengers also have access to the nearby Singapore Airlines SilverKris lounge, but with serviceable WiFi and that all-important natural light ahead of my late morning departure, I remained in the AirNZ lounge – as I also did recently when flying Air Canada from Brisbane to Vancouver with a similar departure time. 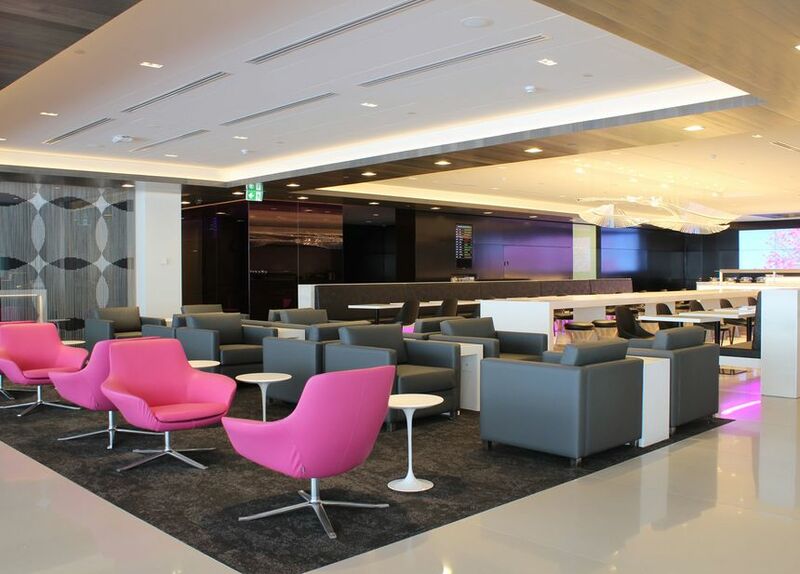 Over in Auckland, passengers flying back to Brisbane or onward to other destinations can similarly visit the Air New Zealand lounge, with a comparable look and feel bolstered by barista coffee, a cocktail bar, food specials prepared to order, and an 'indoor/outdoor' terrace space. With a journey time of 3hrs 10min, NZ136 departs Brisbane daily at 11:15am, reaching Auckland at 5:25pm local time: well-suited for onward connections to points across the United States and other destinations, or simply for those arriving into New Zealand the day before an important meeting. The aircraft that serves NZ136 flies over to Brisbane as NZ135, which is wheels-up in Auckland at 9am, touching down at 9:35am in the Queensland capital after a slightly longer voyage of 3hrs 35min. However, while Air New Zealand runs up to three flights per day between Brisbane and Auckland, only NZ135/136 offer business class: the other flights are served by all-economy jets, including the airline's new Airbus A321neo. If those other departures are a better fit for your schedule, the closest thing to business class is the Works Deluxe experience – similar to the 'EuroBusiness' concept where you sit at the front of the plane in a regular economy seat, but with a guaranteed spare seat beside you. If you're intent on flying business class from Brisbane or anywhere else in Australia, a handy trick to remember is that Air New Zealand flight numbers beginning with '1' offer a business class cabin, but those beginning with '7' do not. For example, NZ136 from Brisbane to Auckland – the flight reviewed here – offers business class, while NZ730, NZ732 and NZ734 top out at Works Deluxe. Business Premier aboard AirNZ's Boeing 777-300ERs comes in a standard 1-2-1 layout, split across a larger cabin of seven rows at the front, and a smaller cabin of four rows further back, behind the second aircraft door. While I was travelling solo on this AirNZ flight, I've previously put that to the test in Virgin Atlantic Upper Class which features the same basic seat, and found the tray table large enough to accommodate two meal plates (pictured below), but the legroom on the cosier side when doing so, making it a better-fit for couples rather than colleagues. A fold-down drink table is right beside, but as it's easy to bump with your elbow, I'll generally keep it closed during the flight and keep everything in that other space above, where it's much less likely to be disturbed. An adjustable reading light sits atop the beverage shelf, joining the standard light above your head. I went for the pork with garlic bread from the basket – both were fresh and tasty, and went well with a glass of New Zealand red – but with no printed wine list, you'll need to make your decision when the crew come by. Inflight WiFi is also available on selected Air New Zealand aircraft: charges apply. On today's flight, cabin crew were friendly and cheerful, and their announcements were a pleasing detour from the normal boilerplate script adopted by most full-service airlines, such as "skipper here" when the captain made an address, and the crew being introduced as "fresh from the Maroochydore Macarena competition last night", which got a few chuckles. Being a three-hour journey, I didn't have a need to use the call bell as the crew were never far away, but without them being intrusive or bothersome. All things considered, a very pleasant way to travel between Australia and New Zealand, given you don't have to step past anybody to access the aisle – or give way to other passengers who are doing so – as you would on Boeing 737 flights operated by Qantas and Virgin Australia on the same route. The lack of bedding equipment on such a short flight also wasn't a problem: if not taking photos, I wouldn't have wanted to fold the bed down anyway (and the star rating given to the seat reflects trans-Tasman travel), although on longer routes, the limited privacy afforded by the seat's design compared to the business class experiences of many other airlines wouldn't be as ideal. Chris Chamberlin travelled to Auckland as a guest of Air New Zealand. My impressions from flying in them in two words" Bloody awful " Only saved by ANZ good service . Terrible design and layout. No way I would do long haul with ANZ again until they change those seats. Plenty of other carriers with hugely better seats out there. Totally agree....I flew on their J class to LA a year ago and the experience was horrible. Seat itself was already bad enough and the crew of the flight wasnt helping either. Absolutely agree! Those seats are horrendous and why would anyone actually want to sit facing into the middle of the aircraft . Even worse though is their current safety video. The flight attendants were all complaining it is degrading to them as well. Surely this is a safety issue, not a personal taste issue. A friend sent me this as received from their feedback centre. Yo Air Enzed yo vid’s a lark! But y’planes are bitchin’ and yo crew is sharp. Siz narly to peep your peeps so kewl. But me thinks it makes ‘em look like fools. Coz yo brand is betta and yo tearin’ it apart! Yo whats it about, some rappa’s in the joint? Yo not really shinin’ but perhaps yo knew. id take a skybed 2 any day! Each to their own, but frankly that amazes me. The Skybed is a tired old product with very limited storage and privacy, a lumpy sleeping surface and a droopy end. There's no doubt that NZ's current seat is now outclassed, and not in the same league as the reverse herringbones or the best of the staggered designs (though I prefer it to some of them). But I do think that some of the criticism is overblown, and where it really comes into its own is for sleeping, where the very flat dedicated sleeping surface and the fantastic mattress pads make it by far the most comfortable business class bed I've experienced (and I've tried plenty). It also feels notably more private in bed mode, when you're much more surrounded by the walls, than it does as a seat. The vast majority of NZ's longhauls are overnight flights so this set of compromises actually works fairly well for them. Having said that, I'm impatient for their new longhaul product to be released. The real mistake NZ made was not introducing a newer product when they refurbished the 777s and introduced the Dreamliners - a similar mistake to what they did in the mid-90s when they barely evolved their (recliner) business class seat. In this business you can't get two generations worth of value out of a single design, without slipping well behind the competition. Having been on both Skybed II and ANZ within two days of each other, I’d take SB2 any day over ANZ. And yes, I too HATE that horrible safety video! The rap safety video has been withdrawn after to many complaints. As from 4 Feb 19, there is a 'new' safety video being one of the more popular ones - the 2016 'Bay of Islands summer' video. I've just returned from a trip across to CHC (8 & 11 Feb) and the bl**dy rap video played on both legs so it's still there. Appalling. Stared at it in disbelief on the first leg, read my book on the return. Despite Air NZ getting alot of complaints from business travelers about the Business Premier 'coffins', Air NZ says, their research has found, that most travelers who travel in Business Premier are leisure travelers, so they are not in rush to replace the seat product until the decision has been made on the B772 replacement despite the seat product is 14 years old. That said, Air NZ is working on a new Premium Economy and Business Premier seat product that facts in ultra long haul travel. Air NZ's own business traveler research, has found NZ based business travelers will prominently use Premium Economy on the B787's and B777's or Works Deluxe or Space + 'Seat Only' or 'Seat/Bag' on the A320/A321's on Trans Tasman services. Air NZ was one of the last airlines to switch from recliners to flat beds years ago, and once again they are behind the curve in rolling out a new J seat. But on AKL US routes, they have a monopoly, and on their routes to Asia they either have no direct point to point competition or have cleverly obfuscated the regulators into approving joint ventures with their competition (SQ, CX). Combine that with the loyalty they have from NZ based flyers as a result of their virtual domestic monopoly and who don’t know better / think the sun shines out of Air NZ’s behind, and they don’t really have an incentive to roll anything new out beyond their current thinking of 2022. True, though AA isn’t year round and UA - surprise! - ties up with NZ. I agree this seat is now dated and behind the curve, but to say they were one of the last to switch from recliners to flat beds is simply not true. They were in fact one of the very first to have herringbone seats and a 1-2-1 layout offering direct aisle access to every seat... something QF only achieved with the launch of their business studio a full decade or so later! Good point mad_atta - it’s now a bit dated but when it came out in I think 2004 (was that the year I won the Flyertalk AirNZ rugby competition btw? ;)) most airlines were just introducing angled “lie flat” and after BA, AirNZ were one of the first to go truely flat bed and herringbone ie direct aisle access for all - it was pretty much best in class. The outward angled seats like on CX didn’t exist yet. It’s a dated product now but not sure it deserves quite so much negativity - it’s more private than SB2 and agree one of the most comfortable beds with the memory foam mattress on. Is that Champagne in a beer glass though? I'm extremely surprised to see this seat given 4 stars when the recent review of Cathay's J seat was only given 3.5 stars. Cathays seat has more privacy, more storage, a better entertainment screen and more usable shelf / flat spaces. This is a trans-Tasman flight review, so simply put, it's is a four-star seat for a three-hour flight, whereas Cathay's is a 3.5-star seat for a nine-hour flight. As the review clearly mentions, the star ratings here focus solely on trans-Tasman travel, and also take into context that most other business class passengers flying between Australia and NZ are doing so aboard Boeing 737 flights with regular reclining seats at best, which have no privacy, little storage, sometimes no fixed entertainment screen at all (VA), and so on. It's not the best seat in the market, certainly – Qantas runs A330s with Business Suites on some flights, Emirates still sends A380s to Christchurch with 1-2-1 business class and additional seating at the cocktail bar, and then there's China Airlines for Brisbane flyers (and LATAM from Sydney, albeit 2-2-2) – but for a mere three-hour daytime hop, NZ's 1-2-1 seating is highly competitive on trans-Tasman flights, and thus 4/5 on the seating front. And don't forget that they have a window. Sitting with your back to the window is ludicrous. The Cathay business seat is great. 4/5 star rating for the seat is surprising. That's 80%. When I was in school a fair while ago, 80% was an A. I certainly wouldn't give this seat an A. You don't think a lie-flat seat with direct aisle access is worthy of 4 stars for a 3.10 hour regional flight? 'Grannular', it's only worth 4 stars because of the 'fussy' memory foam mattress. If you make up the bed for a short hop across the ditch then you're on a winner. I'd guess most of us don't ... so we sit there looking out the window with the back of one ear (or the other, depending on side of cabin), whilst enjoying the severely limited seat recline (compared to other, more modern products). Haha, I'm the same as you. Whilst I can appreciate it isn't the most private when in seat-mode, the flights to North/South America are overnight, so when in bed-mode, it's one of the most comfortable sleeps in the sky. And yes, the service and food are great too. I disagree, ANZ crew have always been excellent on LHR-LAX and LAX-LHR. Appreciate privacy issue but as both these flights are in effect night flights it's meal and sleep. Sleeping is never a problem for me, except on awful BA Club World. The Star Alliance Lounge at LAX is run by ANZ and is excellent with outside terrace. With 3 US Legacy carriers, BA, VS, ANZ is an excellent alternative in my view. I think had I waited 20 mins like you did in Priority Check-In queue, my emotions would have got carried away with me. But I suppose lucky for that Champagne in the Beer glass. I live in southeast Queensland and this is my preferred way of getting to and from the USA. The seat is short of storage space and privacy, but as a bed it is more comfortable than the QF and VA competitors as it’s wider for your legs. Best of all is the scheduling for North America. Returning on QF or VA is fine, but their schedule means that the BNE-LAX flight is effectively 11 am to 1 am Queensland time, whereas the NZ route via AKL means that sleep is possible and that you don’t land 8 hours prior to your hotel room being available. Have to agree with most in relation to the Bus Class seat.Have traveled on many ANZ Bus Class flights and even with the service being very good the seat is far too narrow,over crowding the seat in front and behind.Very little storage for anything but a magazine,tray table rests below pullout TV screen and is cumbersome with any meal present.Definitely 3 out of 5.Business Class cabin is NOT a private cabin like others.People see you and you see others very easily. Qantas A330 is definitely superior and flys on this route (but was not pointed out) and other ex OZ cities. ANZ 777 obviously better than a QF737 so choose carefully. I believe Air NZ is ripping out those aisle-facing seats soon. Good thing! Am sticking to QF A-330 services till they get it right. And as for the one-class A320s, don’t make me laugh. I don't care how good their service might be or how nice the food might be, count me out on those seats. Not a hope that I'll fly in a seat like that. Looks awful. I traveled J class return from Melbourne to the US on Air NZ last year. I was happy with the flight and am about to do it again. The flat bed comfortably fitted my 191cm frame which is more than I can say about the bed on some Asian airlines. On the trans-pacific flights I spend more time sleeping than awake so for me the bed is the most important thing, and the ANZ service and food did not disappoint. Air NZ business class fares are considerably cheaper than direct Melbourne flights on QF and UA. Also, Auckland is preferable for transit rather than that wretched Sydney airport. Thanks Chris but this is supposed to be a critical review and saying that there is a link where you can check on alternative options doesn't cut it for me. The simple fact is Q has a superior product on this route and that did not come across clearly in your review. Moving forward, we would once again remind readers that the comments section below articles is provided for readers to discuss the topic of the article among themselves. Readers who wish to provide feedback directly to the writer or editor of a work, or who take issue with the way an article is written or presented, are invited to send that feedback via email (as outlined in AusBT’s long-standing comment policy), in the interests of keeping discussions on-topic and on-track. Haven't done the 773 but have done the 772, same seats, to and from HKG a few times. Totally agree with any negative sentiment previously expressed ... and any that follows. Coffin boxes. Knock drink off poorly positioned, tiny fold out table ... as mentioned above ... always a full glass. Horrible. Back of your head to the window or heads back to back if travelling as a couple in the centre pair, with a high divider panel that can't be lowered. Then there's that ghastly, manual, 'flop over seat-back' bed ... just as you're starting to nod off ... get up, fold seat-back down, find and rearrange seat belt, break out mattress, break out pillow. clamber into bed from foot end ... now wide awake again. And don't get me started on that terrible, noisy, over-crowded, over-bright, $24m monstrosity they call an 'International Business Lounge' ... toward the final few red-eyes the food is virtually non existent, the floors dirty around food and drink areas and the toilet floors awash in urine. Too spoiled by Cathay cabins and lounges I guess. Try the tired old Qantas Lounge if you have access privileges ... much more 'couth'. Sometimes wonder if Air NZ management have ever experienced other vendors products. Regardless of whether it's a Trans Tasman or longer, this seat is dreadful. And having travelled in it, I felt peculiar sitting there, and seeing other people's heads in a line along the cabin - apart from the ergonomics with a window behind - it simply looks odd. Cathay got rid of their so called 'coffin-class' seating at least five years ago. I find the seat extremely comfortable in sleep mode although not so keen on the limited recline options. Food and beverage and service outstanding. This poem deserves more upvotes. We recently flew Air New Zealand and Qantas between Brisbane and Auckland. I agree that the ANZ configuration is horrible, I found myself just staring about people because there was absolutely NO privacy. So uncomfortable and I have no idea in what universe why ANZ would think this configuration would be a good idea! If they were just to change the configuration, it would be my favorite, as those seats were bar none my favorite, crazy comfortable. The ANZ seats are way better than Qantas' new seats, which was a disappointment, as the Qantas cabin configuration is a dream with their privacy. Yes, they are quite comfortable once made up (and you're wide awake again), but unless you normally sleep in a 22" wide bed with high solid bed-sides, you're not going to mistake them for home sweet home ... and your own bed probably doesn't have the automatic sensor that turns on light, niggly turbulence as soon as you close your eyes. Apart from that, wife and self have a few clicks on the clock and climbing in and out via the far end is no longer an exciting adventure ... and reversing the procedure as soon as the turbulence starts and you realize sleep will be impossible simply exacerbates the suspicion we should have booked the Cathay flight with its upright to flat-bed at the touch of a button, right way around herringbone layout and oodles of personal 'flat space' and storage. The first, and only, time I took this service I found myself looking enviously at the lucky sods in Premium Economy. Tells you everything you need to know. So glad I found this review. I was considering NZ for my next USA trip, but had no idea about the seating layout. NZ is no longer a contender for my business. Review is nearly spot on, perhaps too kind where the meal is concerned. Basically, it is an economy meal in a rectangular porcelain dish. Beef fillet are almost non-existant. Too expensive for the airline, and when they are, they are overcooked. Stark contrast to the meals of yesteryears where even a fillet is served in economy on a round plate. 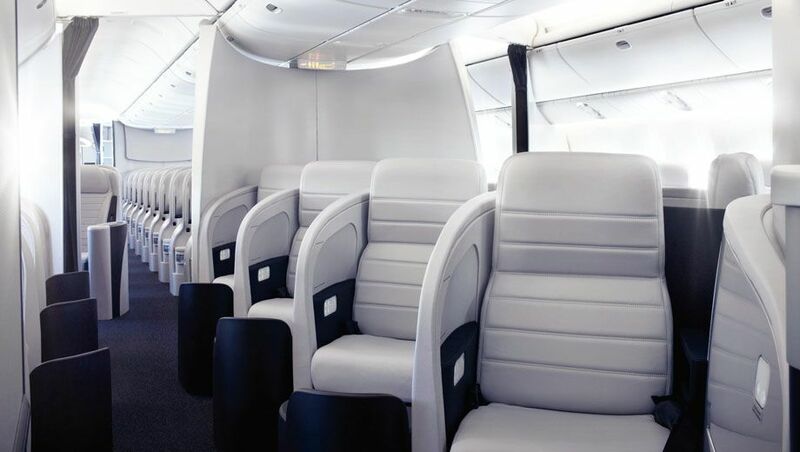 Comment on "Air New Zealand Boeing 777-300ER Business Premier business class"